Dehumidifiers are home appliances that are used to reduce the humidity inside a house or building. The reduction of excess humidity inside a house has various benefits such as reducing the number of allergens that could cause sickness and also reduces odors. Dehumidifiers reduce humidity levels by removing water from the atmosphere and disposing it. High humidity is often associated with a host of problems, both domestic and Industrial, and a dehumidifier of appropriate capacity can transcend these issues and ensure protection for you, your home (Home Dehumidifiers) and your business interests. Domestically high humidity levels are often the source of many problems ranging from the annoying, such as floorboards that squeak, to the damaging, such as wet stains on surfaces which can prop up maintenance costs. Allergens such as mold, fungus, and dust mites also thrive under damp conditions, causing/exacerbating respiratory problems. Many household appliances too are designed to operate under normal conditions and prolonged exposure to high humidity may result in accelerated corrosion and other performance issues. High Relative Humidity levels can also negatively impact the on ability of the body to cool itself. Normally, the body cools itself by releasing sweat and salt through pores in the body. As this sweat is released transforms into vapor and is released into the atmosphere. The energy required to transform the sweat from liquid to vapor (known as latent heat of vaporization) is absorbed by the body, reducing its core temperature. However, when humidity levels are high, the sweat released from the pores fails to evaporate causing the body to overheat making it uncomfortable, hot and stuffy. The threats do not end there either. As the body overheats, it increases levels of perspiration in an attempt to cool it down meaning more fluids are thrown out through the pores in the skin. However as explained earlier as the air is already saturated all this does is remove fluids from the system which if not replaced can lead to dehydration. Even worse, as the body fails to cool down, it may reach very high temperatures leading to heat stroke which is often fatal. Deaths due to dehydration and heat stroke are common among workers in the Arabian Peninsula, especially those involved in construction, and high humidity is one of the prime culprits. High humidity can also have a variety of negative effects on common integrated circuits. For example, continual operation in humid environments can decrease the insulation resistance in electrolytic capacitors. Transistors can also experience increased leakage current and reduced gain, as well. However, the most problematic exposure of electronics to humid environments involves the formation of condensation on internal components (Use Condensation Dehumidifier). If a device is moved from a cool environment to one that is warm and humid, circuit boards may become coated in moisture. If the device is powered before this condensation can evaporate, short circuits between component interconnects can lead to device failure. Furthermore it is understood that corrosion progresses rapidly when humidity exceeds 60% building rust and damaging industrial equipment (Use Industrial Dehumidifier). This is particularly valid when talking about Gulf nations such as UAE, Oman, Qatar or Saudi Arabia. Due to high daytime temperatures and proximity to the Arabian Sea / Red Sea, these nations witness accelerated evaporation rates which in turn leads to high humidity. Particularly affected are the coastal cities such as Doha, Dubai, Muscat or Ajman. In these cities, high humidity is often coupled with high diurnal temperature variations causing continuous and significant damages to your equipment, driving up depreciation costs. In fact dehumidifier UAE are so common that home dehumidifiers are one of the defining features of a normal UAE household. Typically, dehumidifiers are divided into three major groups based on working principles as heat pump dehumidifiers, chemical absorbent dehumidifiers, ionic membrane dehumidifier and ventilating dehumidifiers. Heat pump dehumidifiers are the most common type of dehumidifier and are also called refrigerant dehumidifiers. A heat pump dehumidifier has a fan that draws the moist air from the room into the appliance. The air is then passed through a heat exchanger or condenser coils where the moisture from the air is turned into a liquid which is then drained out and the dry air is sent back into the room. Chemical absorbent dehumidifiers use a desiccant absorbent like silica gel (Desiccant Industrial Dehumidifier) to absorb the moisture which is then sent out through a vent. This type of dehumidifier is commonly used in extremely hot conditions or for industrial applications. The most inexpensive type of dehumidifier is the ventilating type which pumps the moist air out through a vent. Some of the common places in UAE to get in touch with manufacturers and dehumidifiers suppliers UAE are SAIF zone and Ittihad road in Sharjah and Hor Al Anz in Dubai. Dehumidifiers are broadly classified into four based on working principle as refrigeration based Mechanical dehumidifier, Desiccant dehumidifier, Ventilating dehumidifier and Ionic membrane dehumidifier. A Desiccant dehumidifier gets its name from the extensive use of Desiccants which are hygroscopic materials such as Silica Gel which absorb moisture from the atmosphere. Desiccant dehumidifiers operate by absorbing excess moisture in the atmosphere using hygroscopic substances such as silica gel. Silica Gel is a granular, vitreous, porous form of Silicon dioxide made synthetically from sodium silicate. When dried Silica gel transforms into Silica xerogel which has an even stronger affinity to water than Silica gel. Desiccant dehumidifiers operate by passing air through a rotor which contains moisture absorber silica gel or silica xerogel. As air passes over these desiccants, they absorb moisture from the air. They will continue to do so until they reach moisture saturation. Meanwhile the dry air from which the desiccants have removed the moisture from is pumped back into the room reducing humidity. When the desiccant material reaches saturation they are automatically removed and heated and “recharged”. During this process the absorbed moisture is recovered as condensate which can be removed at a later time. The recharged Desiccant material meanwhile, is taken back to the rotor so that the process may continue. As desiccants continue to absorb moisture even at low temperatures, Desiccant dehumidifiers are capable of functioning even at low temperature meaning they can work well in air conditioned spaces. Desiccant-based systems are more economical than refrigeration systems at lower temperatures and lower moisture levels. Typically, a desiccant dehumidification system is utilized for applications below 45% RH down to 1% RH. Additionally Desiccant dehumidifiers are quieter than Mechanical dehumidifiers and generally smaller. However this does come at a cost with Desiccant dehumidifiers incapable of processing larger moisture loads. This means that multiple desiccant dehumidifiers are needed to dehumidify larger volumes of air. In fact, most desiccant humidifiers are Wireless Mini Dehumidifiers, which are used for dehumidifying small spaces. Desiccant dehumidifiers are generally preferred to Mechanical dehumidifiers in Domestic applications where the amount of air to be dehumidified is lower. Crucially, Desiccant dehumidifiers are air conditioner friendly meaning they work just as well at lower temperatures making them even more attractive for domestic and office use. Basement dehumidifiers, for example, are always designed as desiccant dehumidifiers, as basements are usually colder and has a comparatively lower air circulation. Mechanical dehumidifiers are also called Refrigerant based dehumidifier. Mechanical dehumidifiers remove humidity by cooling down the air and collecting water as condensate. Mechanical dehumidifiers work by removing moisture directly out of the air. Mechanical/refrigeration dehumidifiers draws moist air from the space to be dehumidified and sends it over a refrigerated evaporator coil which cools the air below its dew point temperature. This removes moisture from the air as condensate and hence dries the air. However, during the process of moisture removal, the mechanical dehumidifier also cools the air to below room temperature. For this reason the dry air is passed over a condenser coil which reheats the air after which it is pumped back into the room. This process works most effectively at higher ambient temperatures with a high dew point temperate and dramatically falls in efficiency as at lower temperature and humidity. At lower temperatures evaporator temperature falls below freezing point causing the vapor which comes in contact with to freeze and creating ice which blocks further flow of air over the evaporator. This dramatically reduces the ability of the dehumidifier to function properly. The addition of a frost sensor can overcome this problem by shutting down the evaporator coil when it senses ice formation. This then allows the evaporator coil to warm and defrost. After the coil has been completely defrosted, it automatically restarts. While this mechanism can be used to customize a Mechanical dehumidifier for lower temperatures and humidity, the process is inefficient and a Desiccant dehumidifier is a better alternative under those conditions. Refrigeration-based dehumidification systems are more economical than desiccants at high temperatures and high moisture levels. In general, mechanical refrigeration systems are seldom used for applications below 45% RH. However as temperature and Humidity increases Mechanical dehumidifiers become much more efficient and economic. Mechanical dehumidifiers are also capable of processing a much higher volume of air than Desiccant dehumidifier. Even a single mechanical dehumidifier is capable of performing the work done by multiple desiccant dehumidifiers. However, the Mechanical dehumidifiers have several larger, weighted parts meaning they are loud and cumbersome. They are also not very air conditioning friendly, meaning their efficiency drops dramatically at lower temperatures. For these reasons, use of Mechanical dehumidifiers are generally limited to Industrial and Commercial applications which require that vast spaces to be dehumidified and/or which require that dehumidifier function at high temperature and humidity. In Ionic membrane dehumidifiers a specialized solid polymer electrolyte (SPE) membrane is used as an “ionic pump” remove humidity from a sealed space. It functions primarily on the principle of electrolysis. When voltage is applied to the membrane, the water vapor molecules within the sealed space disassociates into hydrogen and oxygen ions. This process happens at the anode which is placed within the space to be dehumidified. Because the Hydrogen ions released during this process are positively charged, they migrate through the membrane to the negatively charged cathode placed outside the sealed space, where they react with oxygen in the atmosphere to form water vapor. Ionic membrane dehumidifiers have several advantages. There are no moving parts in the ionic membrane dehumidifier meaning no noise or vibration when in operation. Ionic membrane dehumidifiers also do not form condensates meaning they require no maintenance during the course of their long operating lives. Additionally they are compact, works well even below freezing temperatures and have a very low energy footprint. Sadly however, the scope of Ionic membrane dehumidifier is severely limited by their inability to process larger spaces meaning they are used exclusively in smaller, sealed spaces. Even then Ionic membrane dehumidifiers have found their uses in a variety of applications ranging from CCTV and IP cameras to traffic gantries. It is also suitable for use in for display cabinets, electrical panels, LED display lighting and medical equipment to protect your valuables from the ravages of high humidity. As the Cold Room Dehumidifiers function at near or subzero temperatures, high humidity levels within Cold rooms and Walk-in Freezers can lead to excessive condensate or ice buildup. Moreover these condensate particles tend to coalesce on structures such as racks, coils and lighting fixtures. This can make the environments within the chillers and walk-in freezers hazardous and prone to issues like short circuit. In addition, excessive ice buildup can take up valuable storage space and necessitate frequent defrosts which can have a significant impact on operating costs as defrosting is an energy inefficient process. Moreover, as the walk in freezer cannot be operational while being defrosted, walk in freezers become temporarily unavailable, throwing entire cold chains into disarray. However, designing dehumidifiers for Cold rooms and walk in freezers are an extremely complicated task. As these cold rooms and walk in freezers function at near or subzero temperatures at which mechanical dehumidifiers are unable to function efficiently due to ice buildup in at the evaporator coils. As such, desiccant dehumidifiers are preferred to mechanical dehumidifiers in these applications. However, this raises a new problem. Walk in freezers and cold storages are often very large in size and typically require the processing of a large volume of air which is usually beyond the capacity of a single desiccant dehumidifier. This problem is solved by using multiple desiccant dehumidifiers. 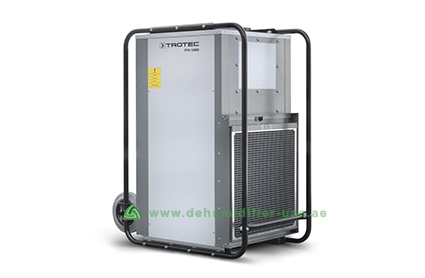 The number of such dehumidifiers in UAE varies according to the capacity calculations. The Vacker TTR range of desiccant dehumidifiers are ideal for such applications. Excess moisture is among the greatest threats faced by warehouses. Damp surrounding can cause irreparable damages to stored goods which can seriously affect customer satisfaction and negatively impact your business. This threat increase the longer the period of storage. Damp surroundings can accelerate the formation of molds and mildew especially in warehouses which store organic produce. This in turn can have a negative effects on the health of warehouse workers driving up healthcare costs and increasing absenteeism. High humidity also accelerates corrosion which can negatively impact the warehouse infrastructure and steeply increase the depreciation costs. Finally high humidity levels may cause discomfort to employees, a factor that has been associated with lower productivity levels. An industrial dehumidifier can help prevent all these issues and ensure that your warehouse does not suffer from loss of productivity. Installation of warehouse dehumidifiers faces two main challenges. Firstly, the normal operating temperature of the warehouse needs to be ascertained. Warehouses operate at different temperatures and this metric is crucial in determining the type of dehumidifier to be used. Warehouses that store organic produce for example operate at temperatures below ten degree Celsius. At these low temperature mechanical Warehouse dehumidifiers become inefficient and hence desiccant dehumidifiers are used. However warehouses that store consumer electronic goods for example can function even at temperatures of 40 degree Celsius. At these temperatures, heat pump dehumidifiers are preferred as mechanical dehumidifiers are cheaper and help reduce the ambient temperature of the room by up to 8 degree Celsius. The secondary concern is the volume. Warehouses are large storage facilities whose doors are opened and closed frequently meaning fresh, humid air enters the warehouse periodically. This along with the large size of even the smallest of warehouses means dehumidifiers have to process huge volumes of air. Hence proper ducting and ventilation systems have to be installed to draw our air from all confines of the warehouse and bring it to the dehumidifier to process. Additionally, warehouses may need multiple high volume dehumidifiers to ensure proper humidity levels are maintained throughout the warehouse. This is especially true in case of warehouses which has to employ desiccant dehumidifiers. Whatever be the needs of your warehouse, the Vacker range of dehumidifiers are so diverse, that it’s virtually impossible to not find a solution that fits your needs among them. Nations of the Arabian Gulf experiences very high temperatures throughout the year. This increases evaporation from all water bodies including swimming pools. The net effect is extremely high humidity which can cause wide-ranging problems. Furthermore, as the daytime temperatures are too high and night time temperatures too low for anyone wishing to take a dip in a swimming pool, swimming pools are mostly constructed indoors where temperatures can be easily controlled. This however exacerbates the problem of high humidity. Unlike outdoor swimming pools where the humid air is constantly replaced by dryer air from surrounding areas, within the closed space's humidity can rise rapidly. Increased levels of humidity can have several adverse impacts on the surroundings. Moisture from the air condenses on the walls and ceilings causing damage to paintings, wooden panels, clothes and curtains. Mold and mildew formation accelerates in such an environment which can have adverse effects on health if left unchecked. The adverse impacts do not end there either. Swimming pools contains chlorinated water and as a result the evaporated water has dissolved chlorine within, which can cause serious health hazardous and bleach / discolor everything it comes into contact with. Finally, high relative humidity can increase the rates of corrosion meaning rapid depreciation of your most valuable belongings. These effects are far from limited to the room with the indoor swimming pool and can lead to increased humidity levels in the neighboring rooms too. As such, every indoor swimming pool needs an efficient dehumidifier designed to function constantly and reliably to remove moisture from the atmosphere. Furthermore, the rate of removal of moisture must be at least equal to the rate of evaporation from the swimming pool. Because they demand such high rates of dehumidification generally mechanical dehumidifiers are preferred in such applications. Vackers featured Swimming pool dehumidifier model DS51 comfortably meets these demands. It is also a multi-functional unit capable of temperature control in addition to dehumidification. It is also fully automated with temperature and hygroscopic sensors detecting even the slightest variations in temperature/humidity levels and initiating the required response to ensure hassle-free protection to your valuable property. High humidity levels common in Arabian Peninsula is a common problem faced by house owners. High humidity levels are associated with formation of mold and mildew which are common allergens and may cause respiratory problems. Damp environments also produces a foul odor which can be repellent and disturbing. Formation of condensates on walls and wallpaper can also lead to loss of paint or peeling of wallpaper. These factors necessitate frequent maintenance and hence have the capability of burning a significant hole in your pocket. Even more costly is the effect high humidity has on consumer electronic products. Moisture from the atmosphere can condense onto valuable electronic products, causing its circuits to short. Such short circuits causes irreparable damages to your electronic products and can drive up replacement costs. Portable dehumidifiers are small and ideally suited to the needs of the domestic user. Portable dehumidifiers are flexible with respect to working principle and can be designed to suit individual needs. Those with larger homes for example prefer mechanical dehumidifiers as they have larger capacities. In addition, some of the biggest drawbacks of mechanical dehumidifiers such as greater noise or inability to function efficiently at lower temperatures associated with air conditioned environments of home or office can be dealt with by placing the dehumidifier system in the periphery and connecting it to the rest of the house through ducts and ventilation systems. The additional cost of installing the ventilation system will be repaid long term through energy savings too. Smaller households and Apartments however, do not have the luxury of installing such ventilation systems generally prefer the smaller, quieter desiccant dehumidifiers. Vacker has a huge array of dehumidifiers with varying specifications to suit your each and every need. As Dubai and other major Gulf cities try to reinvent themselves as shopping and commerce capitals of the world in an effort to diversify their economies, competition has heated up in the commercial services sector. As such, ensuring customer comfort and satisfaction has become of paramount importance. Dubai, Muscat, Sharjah and Ajman are all coastal cities with high humidity which coupled with high temperatures create an uncomfortable atmosphere which may discourage flow of tourists and drive down demand for services. High humidity is hence a menace for commerce and necessitates the use of dehumidifiers in Dubai, Muscat, Sharjah and Ajman. The single most important factor to consider when purchasing a commercial dehumidifier, whether it be a shopping mall, cinema, auditorium, library or museum, is its capacity. Commercial humidifiers have to function within large commercial complexes and hence have to process large volumes of air. As such, desiccant dehumidifiers are never considered for commercial applications and mechanical, heat pump dehumidifiers are preferred. In addition to larger dehumidification capability mechanical dehumidifiers also has a second significant advantage in that it helps reduce reliance on air conditioning systems by lowering ambient temperatures. Most commercial humidifiers are integrated with HVAC systems so as to reach every nook and cranny of the buildings. Vacker offers several options within this segment too. 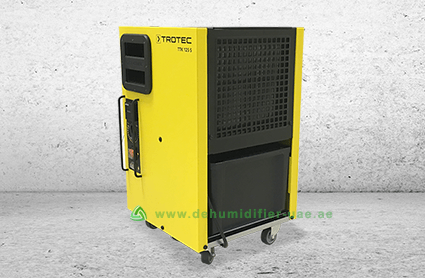 The products range from TTK 400, a medium range commercial dehumidifier capable of dehumidifying 420 cubic meter of air per hour to DH 300 BH which can process up to 5800 cubic meters per hour. Maintenance of optimal humidity levels are of critical importance in Industries for several reasons. High moisture levels can directly impact product quality in some industries such as printing or food processing industries. Corrosion is also accelerated in humid climate and results in wear and tear of machinery which can significantly increase depreciations cost and bring production to a standstill. Electronic products are at particular risk from humidity as condensate formation on electronic circuits can cause the circuits to short and cause irreparable damages. In the gulf, dehumidifiers are very popular within the construction industry. The construction sites within the Gulf nations are often very hazardous owing to very high temperatures and humidity levels exposing construction workers to the risk of dehydration. Dehumidifiers helps laborers resist dehydration by preventing excessive sweating and the loss of fluids which accompanies the sweating. Industrial dehumidifiers are designed to be extra rugged. As most industrial dehumidifiers cater to harsh working environments, they are at risk of breaking down frequently and tough designs ensure that they function even in the harshest of climates. Industrial dehumidifiers are also much harder to install than their commercial or domestic counterparts as most function within specialized plants/facilities of which dehumidifiers are just one component. Depending on the function, industrial dehumidifiers can be either desiccant or mechanical. The most popular Vacker dehumidifier UAE model for industrial application is the TTK 350s. Extremely high humidity levels are part and parcel of marine environments, especially those near the tropics. The Gulf which is perhaps the most important trade hotspot in the world sadly falls into this category and trade ships often have to endure very high humidity levels that accelerate corrosion and foster a hazardous working condition. This makes humidity control within marine environments a safety priority. Marine dehumidifiers are designed for great endurance and installation of one can go a long way in solving the problem of marine humidity. Able to function constantly, they ensure that moisture is constantly being removed from the atmosphere to ensure that humidity levels are kept in check. Marine dehumidifiers can be mechanical or desiccant. In fact most use both desiccant and mechanical dehumidifiers to perform different functions. Saudi Arabia, UAE, Oman, Kuwait, Qatar and Bahrain all lie in the northern desert belt or the “calm of Cancer”. In this region, the air that rose up and lost all it moisture at the equator descends back. This means the Gulf air is generally dry. However, this also means that the Gulf skies are devoid of any clouds meaning very low albedo (the proportion of the incident light or radiation that is reflected by a surface) resulting in very high temperatures. This accelerates evaporation of water along both the Red Sea coast and the Arabian Sea coast resulting in very high levels of Humidity. As this humidity is accompanied by very large desert temperature, the entire coastal region is extremely susceptible to the ravages of high humidity. Read more at Here’s why owning Dehumidifier is important in Dubai, Abu Dhabi, UAE. To put it simply, if you live in Dubai, UAE, you need to find a dehumidifier supplier UAE or expose your family to risks caused by allergens, if you live in Oman, you need to find a dehumidifier supplier Oman or risk shorting your precious electronics equipment. If you live in Doha, you need to find a dehumidifier supplier Doha or expose your machines to increased wear and tear. Finding a dehumidifier supplier Qatar is important to protect workers from risk of heat stroke and dehydration while a dehumidifier supplier Ajman will help you transform your commercial business by increasing customer satisfaction. Finally finding a dehumidifier supplier Muscat who can help protect your protect your property from ravages of excess moisture can save you money in the long term by reducing dramatically the maintenance costs of your home. Read more at Best Dehumidifiers in Dubai, Abu Dhabi, UAE. However it should be noted that while a dehumidifier is an absolute necessity to anyone living or working in the coastal cities of the Arabian Gulf, the continental cities are far from insulated from the problem of high humidity. The extra high temperatures mean humidity can go upwards of 90 percent in summer months. Further, the northwesterly Shamal winds, do in addition of dust, bring moisture from the Persian Gulf into the continental cities. Finding a dehumidifier supplier Sharjah, for example as such still makes sense. Dehumidifier Supplier Dubai and UAE offer a wide range of products to suit your every need. However there are several factors to be considered before purchasing one. Firstly you need to be clear as to where the new dehumidifier is going to be installed. The ideal humidity level required is determined by the application. Domestic Dehumidifiers generally function in the region of 40-50%, the ideal level for people. This may need to be lowered to 30-40% if there are babies and toddlers in your house. Industrial dehumidifiers however have a bit more leeway, with humidity levels of up to 60%tolerable. Only beyond this level does the risk of wear and tear increases exponentially and as additional dehumidification beyond your needs serve no real purpose, humidity levels are set around 55% by Industrial dehumidifiers. Then there are special cases, such as Indoor Ice rinks or Bakeries which may need humidity levels very low. Some specialized electronic equipment may even have humidity threshold as low as 5-10% and hence it is of paramount importance that you fully understand all factors before purchasing a Dehumidifier. Read more at Dehumidifiers, its Properties and Calculation. The second factor to consider is the operating conditions of your dehumidifier. Dehumidifier generally operate best under an optimum temperature which may vary with design. This means special designs need to be considered for crawl space or basement (Basement Dehumidifiers) or Spas or indoor ice rinks. This is also true of humidity. If there is a source of humidity within the operating space of the dehumidifier the dehumidifier needs to be designed for extra endurance. A swimming pool dehumidifier, for example, needs to work continuously to remove additional humidity which forms as the result of evaporation of water from the pool. This means extra endurance and extra power both of which has to be designed into the swimming pool dehumidifier. The next factor to consider is the size of the area to be dehumidified. Larger areas need larger more powerful dehumidifiers to achieve required conditions, and certain indoor pools and Spas or manufacturing plants may need more than dehumidifier to complete the task efficiently. A larger humidifier on the other hand will be overkill for smaller areas and waste energy. Area of space to be dehumidified is also an important factor in deciding the type of humidifier to be used. Generally, the water in liter dehumidifier has to condense per day is calculated. Finally, our dehumidifier range offer a variety of special feature which may be of interest to you as a potential customer. The features range from ducting to heat several spaces using a dehumidifier to an internal condensate pump to pump the water removed from the atmosphere as condensate for further use. Some of the other popular features are remote controls, humidistats, integrated timers, digital controls and caster wheels/handles for easy mobility. The merits of all these features are to be considered carefully before settling on a design. The intentional introduction of outside air into an enclosed (not necessarily sealed) space is termed as Ventilation. Proper ventilation systems help maintain control of indoor air quality by removing and replacing indoor pollutants such as carbon dioxide and can also be modified to assist the temperature control and dehumidification systems. Ventilation systems can also be used to circulate pretreated air. This is done by controlling the outside air's temperature, humidity, and other properties before it is introduced into the desired space. Doing so ensures that the action of an air conditioner or dehumidifier UAE is spread throughout the space evenly and ensure that minimum amount of untreated air interacts with the space. Ventilation systems have two primary functions. It removes indoor air of poor quality and exchanges it with fresh air. Once this is done, it circulates the fresh air within the building. Proper ventilation is perhaps the most important among factors which determines indoor air quality of normal buildings. Modern buildings often integrate heating, ventilation and air conditioning to control, supply and regulate airflow and airflow conditions into the desired space. Such systems are known as HVAC systems. Dehumidification solutions for larger spaces have to almost always integrate with existing HVAC or create new ventilation systems to ensure that the dehumidification is achieved not just around the dehumidifier but throughout the desired space. Vacker dehumidifier Dubai is a leading choice for those looking for dehumidifier in UAE. Vacker has significant foothold within the region, providing services as dehumidifier supplier Dubai, Abu Dhabi, Sharjah, Al Ain, Fujairah, Ras Al Khaimah, UAE, Qatar, Doha, Muscat, Oman, Kuwait and Saudi Arabia. Vacker provides over 30 models of small, portable dehumidifiers for domestic use. TTK 40E, which is an Electric Petite Dehumidifier, has emerged the most popular among those models, standing out with its elegant yet reliable design that bewitches the eyes and calms the mind. Designed to function within small enclosed spaces such as a bathroom or closets which suffer from excessive humidity levels, the TTK 40E hardly takes up any space and ensures protection against mold, mildew and rot. Despite its tiny proportions, this mechanical dehumidifier packs a punch with a capacity of removing up to 14 liters of water every day. The TTK 40 E can operate easily within the temperature limits of 5 degree Celsius to up to 35 degree Celsius and is capable of handling air flow rates of up to 100 cubic meters. It also comes with a 3.5 liter water tank to hold the removed moisture. The device shuts down once the water tank is filled. Despite its design as a powerful mechanical dehumidifier capable of processing great volumes of air, the model produces a mere 43 decibels of sound, much lower than some common electronic products such as the table fan. A mechanical dehumidifier, the TTK 40E uses only a fraction of the energy used by similar desiccant models. The TTK 40E is designed to be easily portable and is hence very compact. Perfect for dehumidifying bathrooms, storage spaces, RVs, boats, classic cars, basements (Basement Dehumidifiers) and more.